The purpose of this week is to analyze the regulatory networks and determine a future in silico experiment to better represent the data. Here is what was considered when results of the model were analyzed. Determine the LSE on the "optimization_diagnostics" worksheet of your output workbook. Compute the LSE:LSEmin ratio by looking at the values given on the "optimization_diagnostics" worksheet. Then in class the LSE:minLSE ratios were compared for the ten models run by everyone in the class. Look at the individual fits for each of the genes in the model and decide which genes are modeled well and which are not modeled well. Additionally, look at the individual expression plots to see if the line that represents the simulated model data is a good fit to the individual data points. Bad= colors did not match and were opposite ie one was red and the either was blue across the entire node. Not good= Colors did not match in most places of the node. Okay= Colors on the heatmap match in certain spots but are opposite in other spots. Decent= Shades are not consistent, ie the optimized is light blue and the actual data is dark blue. Good= The colors on the heatmap were very close to matching for both the optimized and actual data. 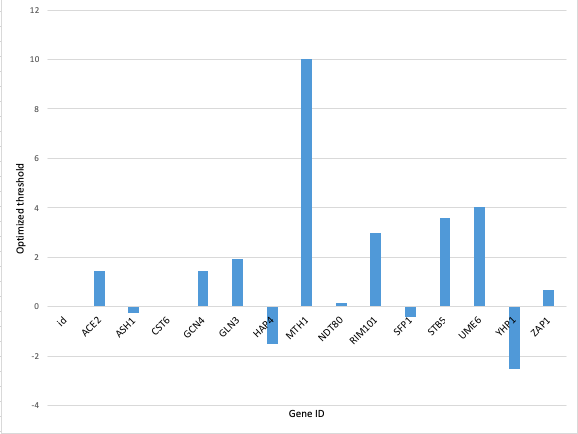 Figure 1: Bar chart displaying the optimized weights per gene interaction which was created as part of the week 6 assignment. 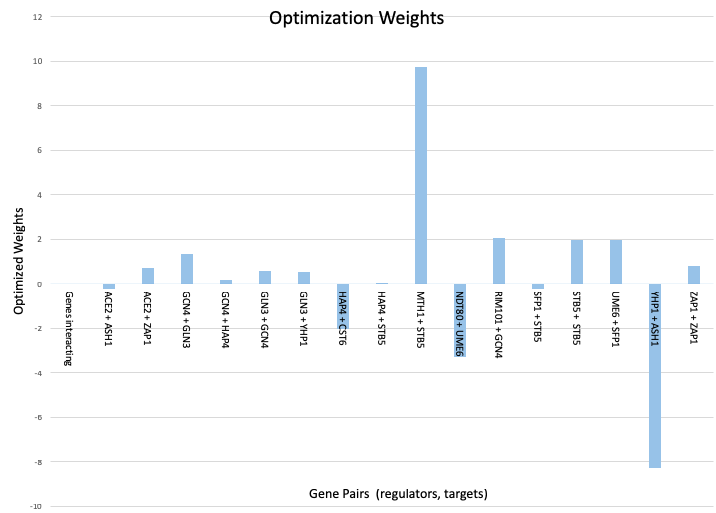 Figure 2: Bar chart displaying the optimized production rates for each gene. 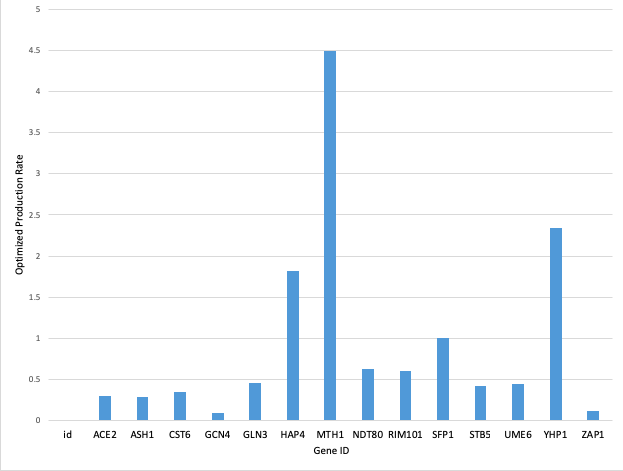 Figure 3: Bar chart displaying the optimized threshold for each gene. It does not appear that there is something about these parameters that explains the goodness of fit for the individual genes. The purpose of the week 7 assignment was to begin analysis of the data that has been collected through the various software including YEASTRACT, GRNsight, and GRNmap. Rather than the computer modeling software telling us the results objectively, this week the analysis was done in a subjective manner. A future in silico experiment will be performed in week 9 in order to hopefully improve the optimized results to better fit the raw data. 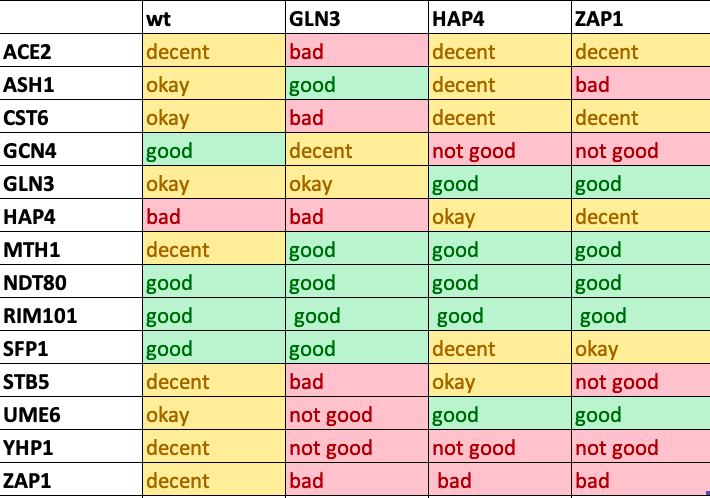 For the in silico model I will be deleting gene Zap1 which was modeled least accurately in the regulatory matrix which was determined by comparing the optimized with the actual data. Additionally, it only had one edge regulating ACE2, as well as it being a self-regulator so I did not feel that deleting it would change too much in my regulatory network. I would like to acknowledge my homework partners, Desiree, and Brianna, and Fatimah who worked with the dHAP4 strain along with me. Additionally, as usual, Leanne was very helpful via text message with explaining some of the graphs and their meaning. Dr. Dahlquist was also helpful in office hours with reassuring me that I was on the right path with identifying which relationships were modeled accurately and which were not represented as well.